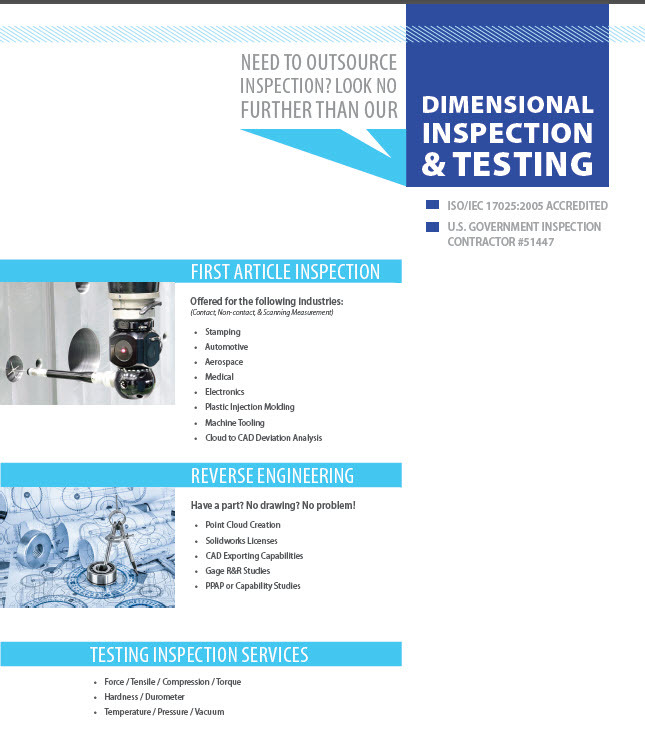 ATI Dimensional Inspection Services utilizes the fastest and latest Automated Inspection equipment to provide competitive rates for dimensional inspection of multiple parts. We provide complete inspection reports that document all data for full traceability. All inspection equipment is certified and calibrated traceable to NIST or other organizations as appropriate. ATI provides First Article Inspection for all types of parts for every type of industry. Inspection reports include measurements for all multiple features and a minimal sampling of nonfunctional multiple features. Send ATI a modeled part that works for an application and we will provide an inspection report for critical dimensions or a fully detailed dimensional drawing from the measured part. ATI provides complete dimensional and tolerance evaluation per DFMA (Design for Manufacturability & Assembly) principles for ease of manufacturability of parts, ease of assembly and proper fit between mating parts of assemblies. ATI also provides services for completing DFMEA (Design Failure Mode Effects Analysis) and PFMEA (Process Failure Mode Effects Analysis) reports. All GD&T measurements are made per ANSI standards. ATI can perform Capability Studies to comply with any customer requirements or to define any process variation or trend. If timing is critical, pick up & delivery service for sample parts and inspection reports is available for a minimal fee.